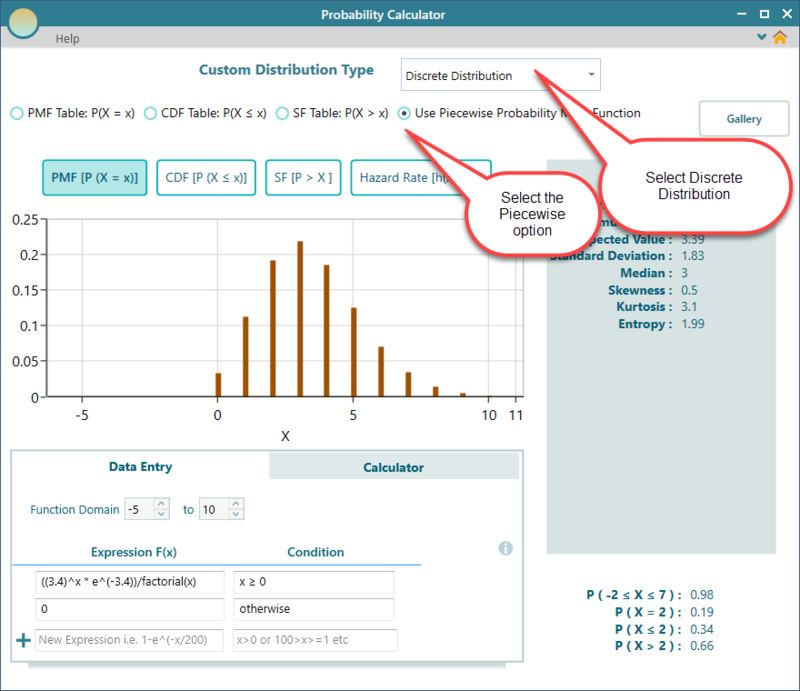 Same like Custom Continuous Distribution, you may want to model a custom discrete distribution if the commonly used Probability Distributions do not meet your need. From the dashboard, choose the 'Custom' button to start. You can use a piecewise expressions for modeling a custom probability distribution. In this chapter, we are demonstrating the functionalities of a discrete type distribution. Select the piecewise option as shown below. Notice the Data Entry tab in the above screenshot. You can easily understand that you can enter an expression using the variable 'x'. Every line represents an expression for a given condition. It is not necessary to have a condition for a single line expression, so you can leave that condition box blank. But, if you have multiline expressions, then, of course, you will need to set condition, otherwise, it won't make sense, right? The expression editor supports many possibilities. You can learn more about the Expression editor Custom Expression Editor. When you define a piecewise function expressions, you need to define the domain of the function. That means the Minimum value and the Maximum value of the Probability Density Function needs to be set. It may be quick and easy to define a distribution by specifying a set of data points that represent a probability value at a given random variable value. 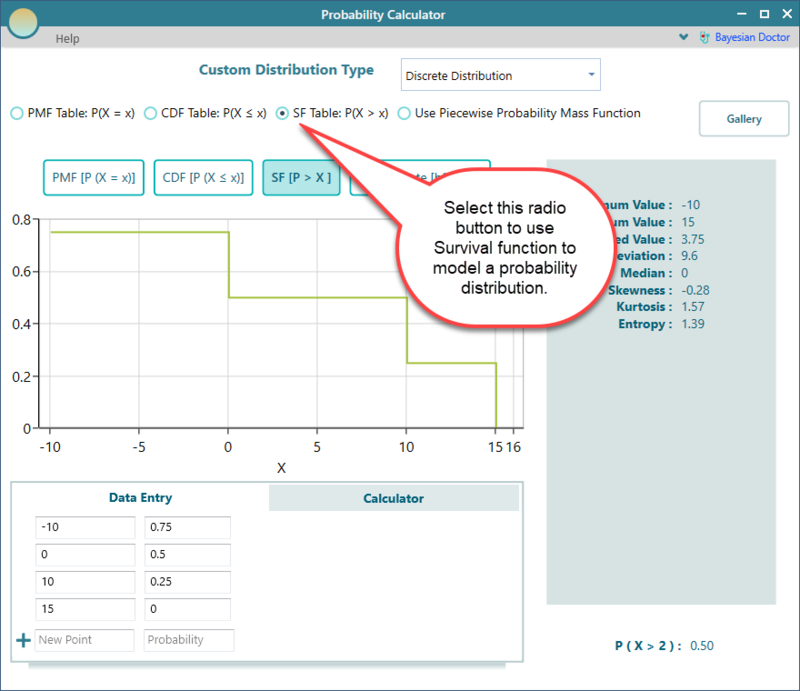 Using this application, you can model a distribution by not only specifying a data table for Probability Mass Function, but you can also use the table for Cumulative Distribution function or even Survival function. 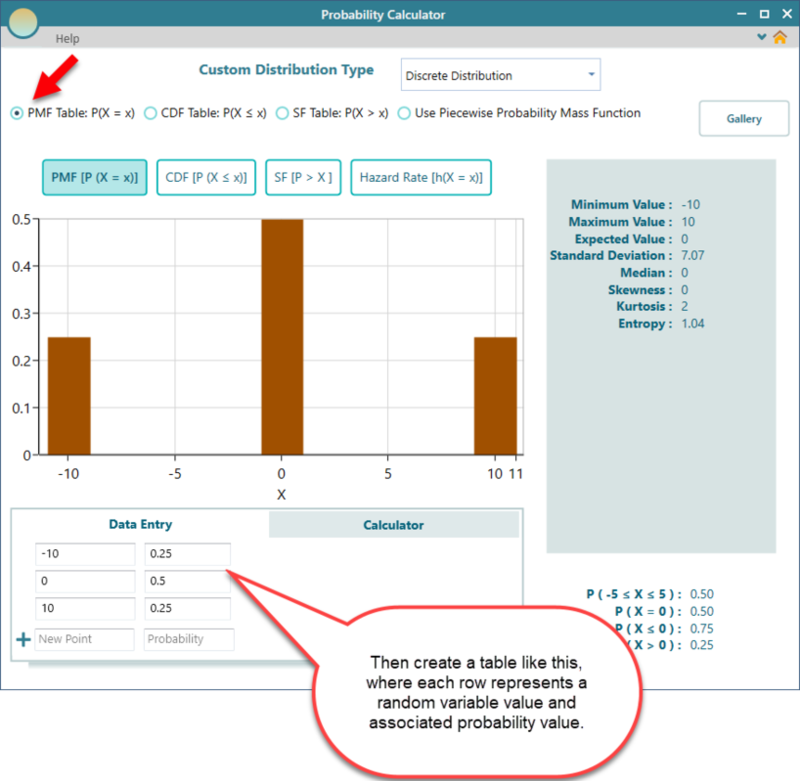 You can model a probability distribution using Survival function table entry. Same like the PMF table radio button, check the radio button for SF table and enter the table data. We created a page for Modeling with Survival Function. Please check this page to learn in detail. 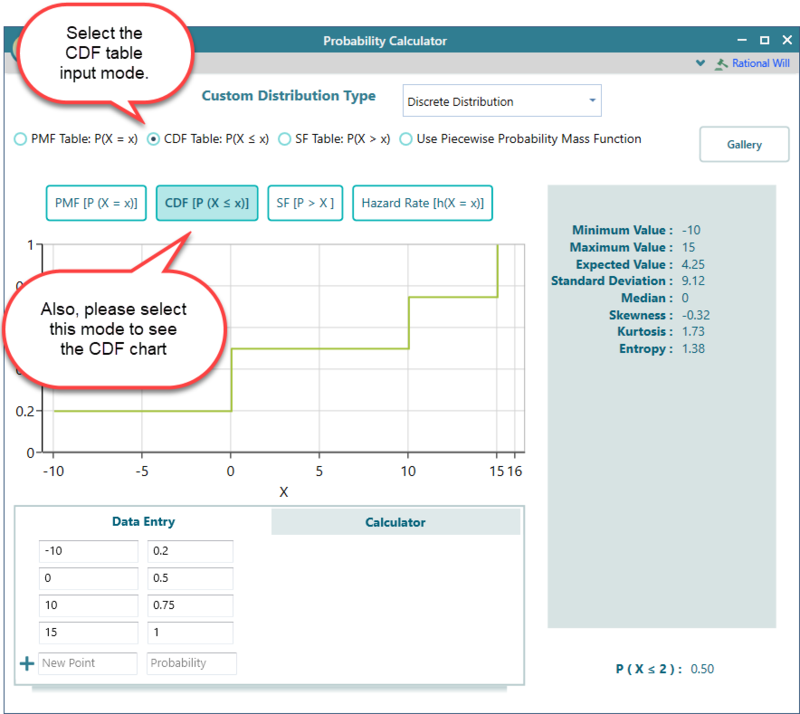 Your options are not limited to only Probability Mass Function or Survival function when using a data table for modeling a probability distribution. We created a page for Modeling Cumulative Distribution Function. Please check this page to learn in detail. The probability distribution properties, and calculated values, all will be based on the scaled function, rather than your raw function.